THE Chautala government is adopting a strange and unacceptable attitude towards the Election Commission of India, a constitutional body. The Haryana Public Service Commission had clear directions from the Election Commission banning all fresh appointments and declaration of results of written examinations and interviews because the model code of conduct was in operation for the February 3 Assembly elections. Thursday’s televised address to his countrymen by Gen Pervez Musharraf was not surprising so far as his decision to hold the post of Chief of Army Staff along with that of President is concerned. Olympian Balkrishan Singh dominated sports both as a sports person and as a coach. He won two Olympic golds and a silver, and his accomplishment on field included representing India in hockey in the 1956 Melbourne (where the team won gold) and 1960 Rome Olympic Games (where the team lost to Pakistan in the finals, winning silver). Iran’s nuclear ambitions cannot be considered separated from its relations with the United States of America. Ever since the 1979 revolution in Iran, the US has made no secret of its desire to bring about a change of regime in Teheran. WHAT do the Museum of Jewish Heritage and the Statue of Liberty and the Ellis Island Foundation, both located in New York, possibly have in common with a proposed memorial that I have in mind for our own country, commemorating the partition of India in 1947? Plenty, if only we were a bit like the Jews and a bit like the Americans. WHEN you have a singer of Adnan Sami’s size you do expect a performance of some substance, with the ability to rivet the attention of the public. However, most of the guests were loitering outside in the lounge area, busy merry-making and networking with bureaucrats and politicians. How can anyone miss Goa? THE Chautala government is adopting a strange and unacceptable attitude towards the Election Commission of India, a constitutional body. The Haryana Public Service Commission had clear directions from the Election Commission banning all fresh appointments and declaration of results of written examinations and interviews because the model code of conduct was in operation for the February 3 Assembly elections. And yet, it defiantly went ahead, releasing a list of successful candidates for the Haryana Civil Service (Executive Branch) and Allied Services on December 31. The reason cited for this haste was that it had earlier filed an affidavit in the Supreme Court that the HCS vacancies would be filled within the year. Even if there was such a compulsion, it could have informed the Commission, which it never did. This is not the first time that the Chautala government has cocked a snook at the constitutional body. The Election Commission has already sought a report from the Chief Secretary on appointments made in the Haryana Police after the model code of conduct came into force on December 17. Even in April last, the Chief Minister initially refused to comply with the order to transfer police chief M.S. Malik after his wife was given the INLD ticket for the Sonepat seat. Having burnt his fingers in that case and having seen the consequences of a similar flouting of orders by Railway Minister Lalu Prasad Yadav, Mr Chautala should have been more circumspect this time. What he and others of his ilk must realise is that the model code of conduct is not for the sake of any particular party but the entire political setup. If other Chief Ministers start defying the Election Commission the way he has, the elections will become a farce. Today, he is perhaps chafing at the bridling of his power. But if he were in Opposition, he would have been equally concerned about a similar misuse of official machinery by the Chief Minister of the day. Thursday’s televised address to his countrymen by Gen Pervez Musharraf was not surprising so far as his decision to hold the post of Chief of Army Staff along with that of President is concerned. Last month Pakistan’s parliament had passed a law allowing him to occupy both positions despite his December 2003 promise to the contrary. His last year’s decision was the result of an agreement he had reached with the MMA, a powerful alliance of six religious parties. In return, he had got the MMA’s support for amending Pakistan’s constitution, which gave him sweeping powers like the power to dismiss the National Assembly (parliament). General Musharraf today sees no reason why he should hang his uniform, the primary source of his political strength. He justifies his refusal to honour the pledge he had made by asserting that “any change in the internal or external policies can be extremely dangerous for Pakistan”. In his opinion, Pakistan should avoid anything that may threaten his socio-political and economic policies and the fight against terrorism. Whatever his justification, the truth remains that once he loses control over the army he may find it difficult to continue as the all-powerful ruler of his country. The General seems to be the least bothered about the opposition’s agitation programme, which was intensified by observing last Saturday as Black Day. This is not because he enjoys the support of the US. The opposition parties — which means the Alliance for the Restoration of Democracy (ARD) comprising Ms Benazir Bhutto’s PPP and Mr Nawaz Sharif’s PML, and the MMA — are as confused as they have always been in their drive against the General’s rule. They may be wearing the façade of unity but that is limited to the issue whether the General should give up wearing his uniform or not. The MMA has been suspect in the eyes of the rest of the opposition ever since it entered into the controversial deal with the General. The PPP has also been faced with a similar problem, particularly after the release of Ms Bhutto’s husband, Mr Asif Ali Zardari, from detention. This is definitely a sad situation for the cause of democracy in Pakistan, which is yet to decide whether it should be ruled by the Army or the civilians. So far the men in uniform have ruled Pakistan, not the civilians. This situation is unlikely to change in the near future. Olympian Balkrishan Singh dominated sports both as a sports person and as a coach. He won two Olympic golds and a silver, and his accomplishment on field included representing India in hockey in the 1956 Melbourne (where the team won gold) and 1960 Rome Olympic Games (where the team lost to Pakistan in the finals, winning silver). He won his second gold as a coach. Balkrishan is also credited with institutionalising coaching in hockey, and the concept of “total hockey”. For this he was uniquely qualified; he left his job in the railways to join the National Institute of Sports at Patiala and literally started the training of hockey on a scientific basis. Known to be a strict disciplinarian, he earned the respect of his charges as well as the hockey-loving world in general by his deep knowledge of the game and his uncompromising attitude during selection and training. A product of the famous Forman Christian College in Lahore, Balkrishan came from a distinguished family. His father, the late Brig Dalip Singh, represented India in the 1924 Paris Olympic Games, and was the first athlete from Punjab to do so. He retired in 1992 as Director, National Institute of Sports, Patiala, having trained not only players, but also most of the coaches that are serving the nation today. Earlier, he had taken over as coach of the Indian hockey team in 1966, and the teams fielded by the nation in the next four Olympics—1968 (Mexico), 1980 (Moscow), 1984 (Los Angeles) and 1992 (Barcelona)—had him as a coach. Balkrishan was the coach of the Indian women’s hockey that won the 1982 Asian Games. He even coached the Australian team. He had taken to golf in his later days, and was active till the very last. Balkrishan was an institution. He has left behind a number of coaches who will continue his work. His leadership will surely be remembered by those who love hockey in India and even abroad. Iran’s nuclear ambitions cannot be considered separated from its relations with the United States of America. Ever since the 1979 revolution in Iran, the US has made no secret of its desire to bring about a change of regime in Teheran. It supported Saddam Hussein in his inconclusive war against Iran in the 1980s and it continues to support the Iranian exiles and dissidents. In response, the Iranians have employed a variety of means to safeguard their position. They have diversified and improved their relations wherever possible, with their neighbours and major powers in Europe and Asia alike. With the US, Iran has remained circumspect and has not opposed its policies where its vital interests are not at stake. In Afghanistan, for instance, it cooperated with the US in search-and-rescue operations, adopted a constructive approach at the Bonn conference and the subsequent formation of the Karzai government. In Iraq, too, it has indicated restraint and accommodation. It helped promote reconciliation among Iraqi Shias. The Shia-dominated southern Iraq has been free from unrest when compared to the violence engulfing the Sunni-dominated Central Iraq. The US has maintained that Iran seeks to develop nuclear weapons despite its commitments under the Nuclear Non-Proliferation Treaty (NPT). It has opposed the nuclear power plant at Bushehr being built with the help of Russia in accordance with the regulations of the International Atomic Energy Agency (IAEA). The US even named two Indian scientists allegedly involved in helping Iran. (No evidence was cited although one of the two scientists did visit Bushehr to advise on safety measures for the plant in accordance with the IAEA regulations). It may be noted here that while supporting the right of nations to peaceful application of nuclear energy, India has reiterated its opposition to the proliferation of weapons of mass destruction. As for Iran, the revelation of Iranian attempts to enrich uranium in 2003 lent credence to US allegations despite Teheran’s assertions to the contrary. The Iranians pointed out that they were entitled under the NPT to secure indigenous supply of fuel for peaceful uses of nuclear energy, including the generation of power. This did not carry conviction with the IAEA, or with Iran’s principal interlocutors. Japan, a major trading partner of Iran, and Russia urged Iran to stop the enrichment of uranium. Iran’s major economic partners in the European Union — Germany, France and the United Kingdom or the European Three — entered into a sustained dialogue with Iran to secure suspension of its uranium enrichment activities. IAEA inspections have established that Iran was producing centrifuge machines to enrich uranium which could be suitable for nuclear weapons. Further confirmation was provided when the role of Dr. A Q Khan of Pakistan in disseminating uranium-enrichment technology to Libya, Iran and North Korea became public knowledge in early 2004. It is also known that Iran has been experimenting for quite some time with laser isotope separation processes for the same purpose. However, it is unlikely to have yielded sufficient quantities of material. Iran is also alleged to be engaged in separating plutonium at undeclared facilities for the production of nuclear devices. And it has been reported that Iranians have been trying to assemble a missile delivery system for a nuclear bomb. Earlier reports have indicated that it has been developing missiles with the assistance of Pakistan and North Korea. The nuclear plus Missile element has put additional pressure on the European Three, engaged in finding a solution to the problem of Iranian possession of bomb-grade fissile material. When the IAEA first reported on Iran’s clandestine efforts to produce weapon-grade fissile material, it and the European Three were able to pressurise Iran to accept additional and more intrusive inspections, mandated in the “Additional Protocol” of the IAEA. This happened in August-September 2003. Subsequent revelations made possible by the discovery of A Q Khan’s clandestine trade in nuclear technology and materials has generated more questions about Iranian objectives. Dr Khan’s motives, other than financial, in transferring technology to Iran are not clear. Is it in the interest of Pakistan to have two nuclear weapon powers as neighbours to the East and the West? Possession of nuclear weapons by Iran cannot be a welcome news either in Saudi Arabia or in Turkey, both friends of Pakistan. Did Pakistan have a game-plan? While Egypt would not be indifferent to this contingency, Israel’s immediate concern is palpable. Its spokesmen draw attention to Iran’s support to militant organisations based in Lebanon and Palestine, engaged in terrorist attacks on Israel. They draw attention to a statement attributed to former President Hashemi Rafsanjani that a single nuclear weapon would destroy Israel. After a series of meetings in Vienna (the headquarters of the IAEA) and elsewhere, the European Three have prevailed on Iran to stop enriching uranium and producing plutonium. This is, however, unlikely to be the end of the story. Iranian facilities are so dispersed that effective, foolproof inspection may not carry sufficient conviction. Iran will be coerced and cajoled into ending the uranium enrichment-related activity completely. As an incentive, Iran may be offered membership of the World Trade Organisation on less onerous terms, and given access to less lethal technologies. It could also be threatened with trade and investment restrictions, especially in the oil and gas sector. It will be a sustained and tortuous process of negotiations. Stakes are high on both sides. Iran needs the European Three to ward off US pressures. In turn, they need to demonstrate to the US that force, as applied on Iraq, is not the only way to limit the threat of weapons of mass destruction. The European Union is united on the policy of non-proliferation of such weapons and thereby hopes to demonstrate its cohesion as a credible player on the international stage. The UK, a member of the European Three, was instrumental in bringing about a settlement with Libya that satisfied US concerns. The task of the European Three will become less difficult and tiresome if they are assured of US willingness to moderate its hostility to the Iranian regime and give up the desire to change it. Iran no longer seeks to export its brand of Islamic revolution. Its primary concern today is its territorial integrity, economic progress and recognition of its regional role. THE first greeting card I received this year was from the Chief Minister of the state! No, do not jump to conclusions. I am not showing off. However, it is true. I am not a bigwig who matters to the CM; in fact he does not know me from Adam and couldn’t care less whether I get run over by a speeding truck the first thing on the New Year dawn! The CM’s office sends me a card because being a journo I feature in the list of a whole lot of people to whom New Year cards are routinely sent as part of PR and image building exercise — people whom the CM is not likely to know or care about! That is why I do not send out New Year cards. And it was long before the e-greetings and SMS came to dent the popularity of cards. Of course, if I send out New Year Greetings cards to all my little-known, fairly well-known and well-known acquaintances it would make a big hole in my pocket; but besides the terrible informality of these cards had always repelled me! Come to think of it, there is a card for every reason and every season. Just pop across to the nearest card store, choose a smart one by shelling out a fortune, sign it and mail it. That is all you need to do to indicate your love, tenderness, concern, best wishes and what-have-you! And as the ads on TV would tell you the recipients would go misty eyed on getting them! So much so that if someone is on deathbed you do not have to visit him. Just send a card and you have done your bit. The fellow is expected to go to the other world all smiles and happiness because you have been so kind and concerned! Tchha! In the first year of implementation of this momentous decision unsuspecting friends, expecting fair return, kept on bombarding me with greetings cards; but after stock-taking when they found that they had drawn a blank from me they put their heads together and pronounced that I was a horrible fellow, a lickpenny who did not deserve a card! When I was called upon to explain I told some that no card could convey the depth of my feelings for them. However, this little ruse did not work much and they got wiser saving money on sending cards to me! Some friends still send cards, incurable optimists as they are. I am sure they would live and learn. As for me, every New Year I sit back counting my blessings and the notes that could have been frittered away on cards, happy to be rid of furious expenses and spurious friends. 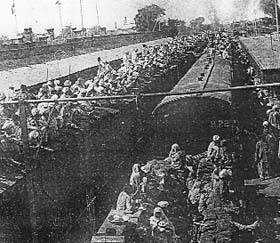 A view of post-Partition mass migration. WHAT do the Museum of Jewish Heritage and the Statue of Liberty and the Ellis Island Foundation, both located in New York, possibly have in common with a proposed memorial that I have in mind for our own country, commemorating the partition of India in 1947? Plenty, if only we were a bit like the Jews and a bit like the Americans. Both never forget their roots and history no matter how painful. The Jewish museum is actually a living memorial to the history, tradition, resilience and lasting memory of the enterprising people. Each corner and nook within these walls mirror the vitality, hope and will to achieve, of a strong-willed race that never gives in. And while always remembering the past, the Jews never allow it to cloud their future dawns of prosperity and success. Today nearly all of the Jews who had not experienced the Holocaust have begun to talk and think of forgiveness and reconciliation. In forgetting they remember, and in remembering they have begun to forget, and move on to better times. The poverty and the pogroms have given way to industry, business and education. They have put behind them the cattle cars in which many of them were herded from place to place, and the memory of the passports the Nazis had issued them with the capital “J” inscribed on them to indicate their ancestry. Yet in raising this memorial, the Jews have ensured a place in the sun for all foreseeable times. It is a memorial to a stirring saga of sacrifice and hope that their ancestors have scripted out for them. The Americans have not been far behind the excellent example set by the Jews in caring to remember their past and the strength that they derive from it. Lady Liberty, which has towered over the New York harbour since 1886 when it was first placed there, courtesy French intellectual Edouard de Laboulaye, signifies a sense of liberty, freedom, and a welcome from the “mother of exiles” to all its immigrants. The immigration station on Ellis Island, opened in 1892 and finally closed in 1954, signifies the heritage and the record of nearly 40 per cent of the Americans who can trace the roots of an ancestor who first set foot at the Golden Gate to America. People from various lands came over here after braving the rough seas, and were quickly and efficiently accepted in their new home. As long as you wished to make America your home and were going to be faithful and loyal to it, you were most welcome. Today the American Immigrant Wall of Honour on Ellis Island carries over 6,00,000 names of those who immigrated through this sea-post, or are indirectly connected with this immigration by the bonds of relatives. This is how this country “celebrates” and honours its ancestors. Incidentally, the Statue of Liberty-Ellis Island Foundation, which looks after both these heritages, has found tremendous monetary support from the American people and big corporate houses to help in the upkeep and improvement of these institutions. In India, the picture is all too different, as the example of Partition would testify. Firstly, how many in India even know anything about the partition of the country or, worse still, care to know? If some want to find out and get to know what this event was all about, there is really no worthwhile single exclusive place or site to which they can turn to and enlighten themselves. How many museums do we have in the country which showcase Partition? It would appear that we were possibly even trying to hide the fact that there was Partition, and the effort was to forget the whole thing as a bad dream. The Jewish pogroms were indeed a bad dream, but then for the Jews this is history and heritage and they preserve every bit of it, no matter how unpalatable it might be for them. The Americans had a great big migration into their country, and they have preserved this as much as was possible by way of photographs, artifacts, old trunks and gunny bags which carried the belongings of the immigrants, and by staging plays — one of them, titled “A Taste of Freedom”, tells the story of the early settlers. What India owes to its people, especially those residing in the North, right up to the capital, New Delhi, and in West Bengal, is a museum or two showcasing Partition and all that it entailed. The killings of Hindus, Sikhs and Muslims on both sides, the uprooting of millions by a simple diktat of humans, the resilience and reconstruction efforts by the refugees in finding a new meaning to their lives, the untold suffering of the countless children and women who were brutally assaulted, and the madness and futility of man-made strife and mayhem, are all fit subjects that any sensible and caring government should have long ago documented for posterity. The mistakes of the leaders of yore, who for their own gain hobnobbed with the British, or worse still were too timid to avert a partition, cannot be the cause of the disappearance of a crucial segment of Indian history. There will be no dearth of international bodies like the United Nations or NGOs and corporate houses or foundations which will be only too happy to construct an imposing memorial to showcase this part of Indian and Pakistani history. Prime Minister Manmohan Singh is himself from pre-Partition India. A black granite stone pillar rising up to the skies as if it were a lament at an unnecessary happening, and two circular walls enclosing the pillar on both of which could be engraved the names of those who went away to Pakistan and then those who came to India in 1947, comes to my mind as a possible memorial that could be installed in New Delhi. This would be a monument of the people and for the people, unlike what we have today, commemorating the lives of some of the leaders of the past. It is not too late to make up for our forgetfulness of the past. Maurya went the whole hog showcasing it as one of the major events in their calendar. Alas, while Sami went flat, some of the public too after drinking. The occasion was aptly christened “New dreams, old charm”, which was meant to announce the introduction of new routes and destinations of Air-India, besides celebrating the success that the airline has achieved. What! This completely went beyond me. Minister Praful Patel seemed to be in a hury as Mr Sharad Pawar’s dinner was more important. Mr Pawar was hosting another musical evening and dinner for Mrs Sonia Gandhi and other bigwigs. At this dinner everyone was seen happy, amused and quiet at home, smiling at one another. It does seem that the coalition partners are getting used to partying together. At least, there is a comfort level somewhere among them. This was more or less an NCP evening as it seemed. As Mr Tariq Anwar and some more NCP members walked in half way during the performance some chairs were pulled up for them right in front of the stage. The hosts also seemed quite put off with Sami as he was trying to crack more jokes than sing. Though many industrialists and hoteliers cancelled their annual New Year eve parties due to the tsunami devastation, some of hour high-flying ministers and MPs are still finding solace in these grief-stricken times in Goa at hill stations and other resorts. Well, how can you miss Goa and the much-publicised gala event on the eve of the New Year hosted by a liquor baron? The star-studded event will be visited by, as usual, politicians, media personalities, bollywood stars and starlets and businessmen. After all, what is New Year eve without dinig, wining, dancing and making merry. I love this: Laloo has finally launched a tabloid. Well, this will be one of its kind obviously. All for Lalooji, the uncrowned king of the RJD and Bihar, aiming high towards the top slot at the Centre. This paper, “Rajad Bulletin,” will take up issues they feel strongly about and are largely ignored by the not very helpful mainstream media. Through their paper they will reach out for their voters and workers. Oh! The newspaper has started a series, “Lalooji Ke Rail Number One”, which talks about the revolutionary changes made by the Railway Minister. The second part is, “Lalooji Ki Rail”, dedicated to Godra and his commitment to expose the conspiracy behind the burning of the coach in 2002. How was Laloo implicated in the fodder scam because of the media trial and how did the media target Laloo and join hands with the BJP against him, the backwards and the Dalits, and how did the poor identify this cunning nature of the media? Well, poor Lalooji had to, in the end, publish a paper for himself by himself and write only on himself. Well, no other politician has been so full of himself, one can say. Sat (truth) Santokh (patience or contentment), Vichar (contemplation). These are the three virtues which man is enabled to cultivate by the study of the Granth. The wise man gets most from other wise men. His mind is open and ever sensitive to words of truth. Like a sponge, he absorbs the knowledge. The Bhagvad Gita advises that all work must be done as if it is worship. The same devotion and care must be lavished on work as is done on worship of God. In this way, self-realisation may be achieved. When the king wishes to give his daughter to the most valorous of all without making enemies of others, he sets the suitors a task. A task so stupendous that none but the greatest would even dare to attempt it. Holiness is to love God and love people. It is therefore not a luxury reserved for a favored few. All are invited to be holy. There is a great deal of truth to the idea that you will eventually become what you eat.